There is no question that a good SPF is worth the splurge. If you have to "save up" for a beauty item, SPF is a great place to invest your money. When you find a sunscreen that works, it is worth the price! With that said, you might luck out and find one that is inexpensive too! I mean, daily use multiplied over time with an expensive product gets very pricey indeed. Also, the drugstores have some great formulations as well these days. So far, my favorite sunscreen is a high-end, Skin Medica's TNS Ultimate Daily Moisturizer plus SPF 20. I adore it, but it is $85, ouch! Also, Skin Medica has reformulated (and renamed) this version over the years and it is gradually getting more expensive. I love it and literally save up for it. But, it would be nice to find something cheaper or something more widely available that I could either get at the drugstore or my local Sephora or Ulta. I previously reviewed this sunscreen (and detailed some of my other favorites) here: Sunscreen for Sensitive Skin. Be sure to check that out! When I am not testing other SPFs, Skin Medica is the brand that I always return to! 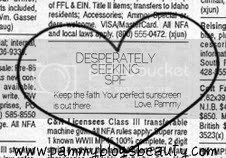 With all that said, it is time to kick-off my Sunscreen Review Series: Desperately Seeking SPF! lol! All joking aside, sunscreen is serious business! While I love my Skin Medica TNS SPF, I would love to find what else works for me! High-end or drugstore, it really doesn't matter. I just want a sunscreen that has effective sun protection, doesn't irritate my sensitive skin, and that wears great! Added antioxidants are always a bonus too! Not only does daily use of a good SPF do wonders as far as age prevention, but also it can literally save your life. I am a fair skinned girl who lives in the South and loves summer days at the beach or the pool. Good sunscreen is a necessity. Skin Cancer runs in my family (My Dad is at the dermatologist almost weekly now having cancer removed) and I have lost a dear friend to Melanoma. Skin Cancer prevention through sun protection is a subject that I take very seriously! Shade is best, but if you must be exposed, a good SPF is essential! I picky about sunscreens because I have very sensitive skin. I need a sunscreen that has effective sun protection and gentle ingredients. Plus, since I wear facial sunscreens daily, I need sunscreen that wears well under makeup. This is a tall order, I know. But great sunscreens are out there! So join me in my search! I am looking for an everyday "low" SPF (SPF 15-30), higher SPF for outdoor activities and the pool/beach (SPF 30 and higher), and body SPFs. I know you readers always have great suggestions. So, I would love to hear them!!! What sunscreens do you like? Keep checking back in as I am planning for "Desperately Seeking SPF" to be a long-running and ongoing series over the next couple years. It takes a long time to test out skincare. So, I am going to target monthly-every other month SPF posts. Stay tuned! I am certain that the perfect sunscreen is out there! Aveeno makes pretty goo ones for everyday: There's an Ultra-Calming w/ SPF 15 for very sensitive skin (I use it when my roseacea acts up. They also have one called Positively Radiant w/ SPF 30. And have you tried the La Roche Posay line? I hear more and more good things about them, and the items I've tried (Toleriane Cleanser and Toleriane Ultra daily moisturizer are very, very gentle. I'm going to look into their sunblocks line when I finish my Aveeno. Hope this helps! @Isis04-Thanks for the recommendations! Oh, I will have to look into the Aveeno Ultra calming! I really do love Aveeno products. I am for sure going to check out La Roche Posay as I, too, have heard great things! A great SPF is a must! Cant wait to test some new products! Pammy, glad I could help! I forgot to mention that both brands are very affordable--no $85. prices, since they're both available in the drugstore and La Roche Posay has a great website to assist you in choosing a product! Happy testing!